Here she goes again! Blouse number three from the same pattern! And why not? I like this blouse pattern very much. It fits, and it has shape. 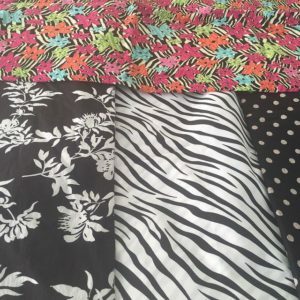 By having a button band/placket, a collar and collar stand and sleeves with cuffs it offers lots of opportunities for mixing prints and colors. something I love to do. Actually, I don’t think that I have ever made a solid color blouse in my life! 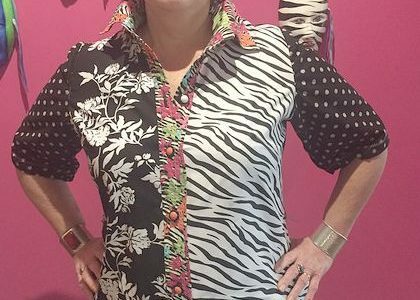 Maybe a blouse out of all one printed fabric. But I most likely added piping or different colored buttons. I just cannot leave well enough alone! So what did I do that is different? 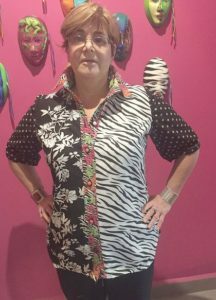 I cut the collar, collar band button band, sleeve placket and cuff out of the mini zebra print. I worked hard to make perfectly turned out sleeve plackets. I am quite proud of them. But after I applied the fully made sleeves, I decided that it was just a bit too much. Yes, you heard it here, Susan said she thought there might be just a little too much going on! Well that very annoying Suz, my Guardian Angel with the messy hair and dented halo had been nagging at me all morning. “Shut up, Suz”, I yelled and batted at her trying to get at the halo. She flitted off, cackling and perched on top of the tall fabric cupboard. I have often said that I should listen to Suz a little more. She is, after all a feminist, and pretty smart. She is my Guardian Angel. I invented her. She is not the one we were taught about at St. Agnes School. Nothing like that at all. Well except she insists on wearing a halo. So after removing the sleeves, I decided that you should at least see my beautiful plackets. I hate to hand sew, everyone that knows me knows this. All blouses need a closure, usually buttons. I love to make buttonholes with my 60+ year old Singer 301A. So buttonholes are not an issue. It is finding the right kind of buttons to complete a look. My friend Sheryl, yes the very same that decamped to Vancouver. Gave me a bunch of her buttons. Boxes of her buttons. 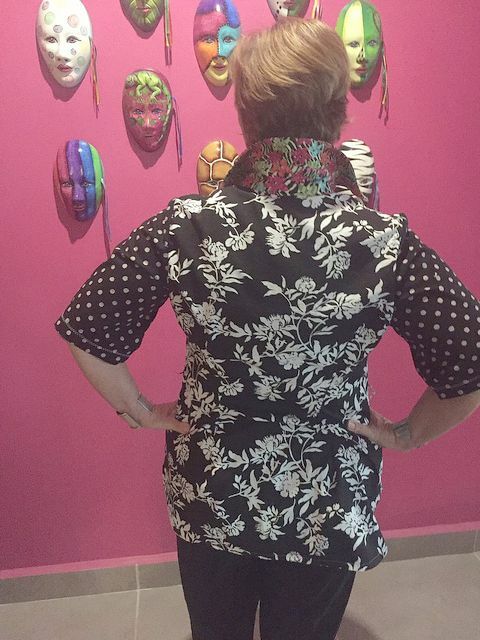 There were no buttons in her legacy that would work with my blouse. Well no buttons that could be sewn on by machine. And there were not enough of any one kind to use all matching buttons. I auditioned a bunch of buttons, and decided on the rounded buttons you see here, the white and orange ones with the black rings. So I used the only two white ones, some of the orange and one black one at the bottom. I like them on the blouse. I decided to do the buttonholes in black, I think it looks rich. I did all of the top stitching in white. Here I am in three nice views that My Beloved took before leaving for work. We were headed out to breakfast and then to the farmer’s market and then to work for him. But we have been having thunder and lightning since the wee hours and the pooches were in a dither. Leaving them to their own devices during a storm was more than we could bear. So no interesting poses of me with cauliflower today. I love the fit of this shirt. 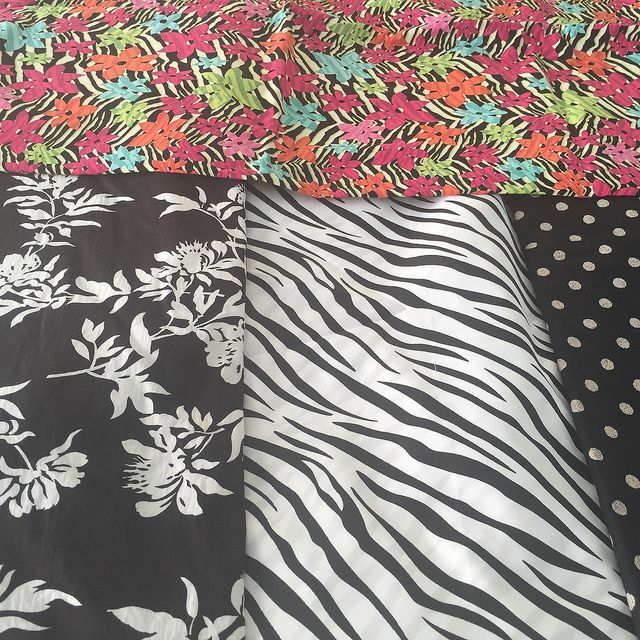 I love the fabrics, all have been in my stash for a while, and they look wonderful together. There have been a few comments by less adventurous folk that think I may have gone too far. They have not seen what I can do with color and print mixing! 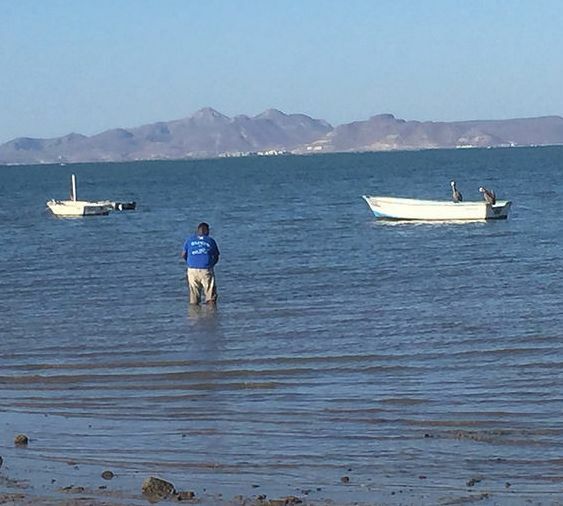 And here is an evening view, of a fishermen hand casting in the bay in front of Big Ruby’s Cantina. 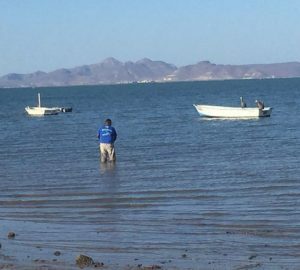 That is downtown La Paz across the bay. Great job, love all the prints and color. You sure can make different prints work well together. Sew on! 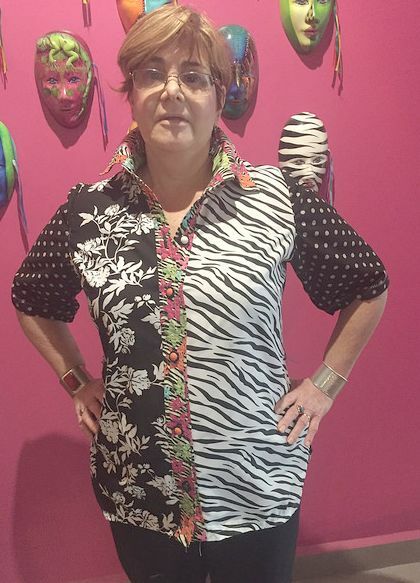 I love this blouse, Susan! I love the mixed prints, but the buttons just finish it. The different buttons always add that extra touch , right down to little details. The color of the button hole and the button . Often the first thing I look at on a nice sweater. is the buttons. The different buttons always add that extra touch , right down to little details. The color of the button hole and the button . Often the first thing I look at on a nice sweater or blouse are the buttons. WOW! Just wow Aunti Susan!! You are the fabric goddess, your take on color and prints is fabulous !! Love the blouse…. I’m a size 6 in blouses btw… Love you and love the blouse! Interesting use of the different fabrics! I really loved the use of the print on the sleeve plackets. I liked the sleeve plackets as well, but on my small frame, it just looked overwhelming. Fab. Just fab. No other comment needed. This blouse is gorgeous and such an inspiration! I never thought of combining different fabrics in one blouse like that. I need to try this. Thanks for the inspiration! be adventurous, try mixing some prints, you’ll like it!